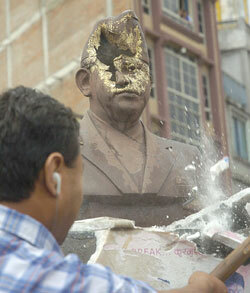 THE PAST IS ANOTHER COUNTRY: Members of the YCL and the ANNISU (R) destroyed statues of past kings around Nepal on Tuesday. So Girija Prasad Koirala has paid another flying visit to Biratnagar. Every time this happens it is followed by some dramatic pronouncement. This time the only drama was that he made a statement about how declaring a republic is not 'easy', which pleased neither the republicans nor the monarchists in his party, nor the NC's fellow travellers, the CPN-M and the UML. 4. Devolving powers and finding another way to run the nation. The situation is getting just too complicated for the country to be governed from Koirala's bedroom in Baluwatar. The non-inclusive structure of the political parties, their lack of consensus-building within parties and between them, as well as the inability of the 7+1 to prove to Nepalis that there is government and that it can deliver have given the governing alliance a major credibility handicap. What we are seeing is not a promised 'new' Nepal but an 'old' Nepal run by the 'same old' faces. The one party that fought and suffered long and hard to liberate the 'people' with violence has been unable or unwilling to make a smooth transition to mainstream politics. Its ministers in government are perceived to be no different than past ministers who loved to pontificate from the pulpit rather than show by actions that they are serious about improving the living conditions of the people. Nepalis, long used to being let down by the thulo manchhes in the capital, are not surprised. But they are deeply disappointed. Sometimes it's not real implementation but the perception that the government is serious about implementation that will satisfy the people. Given how little we have come to expect of Singha Darbar, launching a few fast-track infrastructure schemes or a national campaign to raise the quality of government schools or upgrade staffing in all district hospitals would do the trick. But there isn't even the collective intelligence to do such showcase activities. And who will believe all the rhetoric about inclusiveness from the Big Eight when their own internal party structures are so dominated by high castes? As the most revolutionary member of the alliance you'd expect the Maoists to at least show tokenism, but they are even worse than the NC and the UML. Of the 35 member CPN-M central committee 25 are bahun-chhetri. Even in the western region where the Maoists declared autonomous Gurung and Magar zone, nine of the 13 districts have bahun or chhetri chiefs. Of the 37 central committee members of the NC, there is only one dalit. Of the 15 permanent members of the UML, 13 are bahuns. We are not going to have a new Nepal unless the parties first start putting their own houses in order.